Almost a week later the pain was still intense so went to the doctor for a referral to a chiropractor. She went back to work after the Christmas break. Lynny could no longer sit straight; standing, walking, bending would all cause the pain to worsen, so she gave up her job. Nothing helped with the pain. The medical profession and Accident Compensation Corp (ACC) just kept saying she was faking, attention seeking and it was all in the mind. In 1999, after another fall, and an MRI scan, she found out she had in fact fractured her spine in the first fall. That medical record had mysteriously got “lost” only to be found again 16 years later. The pain grew much worse over the years and Lynny was confined to a bed most of the time. Using a wheelchair when she went to the doctor – the only time she left the house. She became depressed and suicide was never far from her mind. Suicide attempts would feature many times and was the only thing at which Lynny was a total failure. As the years went on, the number of medications increased until Lynny was taking 590 a month. She started making what is now the “Strong Pain Relief Balm” but then was just a “comfrey balm”. Made with comfrey taken from deserted house gardens in the “Red Zone” declared after Christchurch’s earthquakes. Lynny would sell the balm to a few horse folk around Christchurch. She would give pots the homeless men that lived down at a local park to heal their cracked heels. Those old guys started telling Lynny that her balm was good for headaches, bruises, then a broken toe, then a sore back, and twisted ankles. Funnily enough, she never thought of using it on herself then, her pain was so bad nothing but morphine was helping her. She went to the doctor to get a “Do Not Resuscitate” order in place, telling her doctor she intended suicide soon and didn’t want anyone to save her if she were found. The doctor said during the conversation that she shouldn’t stop taking all her medications because it would kill her if she did. Right then Lynny decided to stop taking those medication and die. The doctor then told Lynny not to be silly for considering suicide and sent her home with another 270 different painkillers. … She wrote this post on her WellWelblog 10 days later. Yesterday, I changed a light bulb, vacuumed the floor, stood on a stool and cleared out a top cupboard, put out my own rubbish. Then I walked almost 4kms (ok I had to sit a few times, but still) cooked a meal, and did some yoga exercises. I also have a clear head, and can think properly, and have been smiling and singing most of the day. I guess it doesn’t sound like much. But to Me its a massive achievement. Almost 20 years ago, I broke my back, and have been in constant pain ever since…. so whats different now?? Almost a week ago I took my last painkillers, anti-anxiety, anti depressant, sleeping pills, and started using a cream sent to me by a special friend, I have never meet. Until this morning the withdrawals from that cocktails of drugs the doctor keeps giving me has been pretty hellish. But it doesn’t matter now, it was so worth it. This cream by the way is made with Cannabis, I only need to apply it topically 3 or 4 times a day. Within a few minutes, I’m pain-free, and I can actually think clearly. I didn’t think either thing was really possible at the same time. A year later Lynny read on-line that comfrey was good for pain relief, so she returned to making comfrey balm. She starting by using it on herself then offering it other folks she knew. Lynny started selling it to friends, one encouraging her to sell it on Facebook. She has been selling since early 2015. Sales have improved so much that Lynny has started this website. She can now offer credit card purchases and other options that aren’t available through a Facebook page. In December 2016 Lynny received a lump sum of money enabling her to invest in advertising her Facebook page and buying more ingredients to increase the stock of potions. Lynny still lives with pain and always will, but it’s nowhere near as bad as in her days taking the medications. Now Lynny has control over her pain using her own Potions. Using the last of her lump sum of cash Lynny has bought her own home in Murupara. 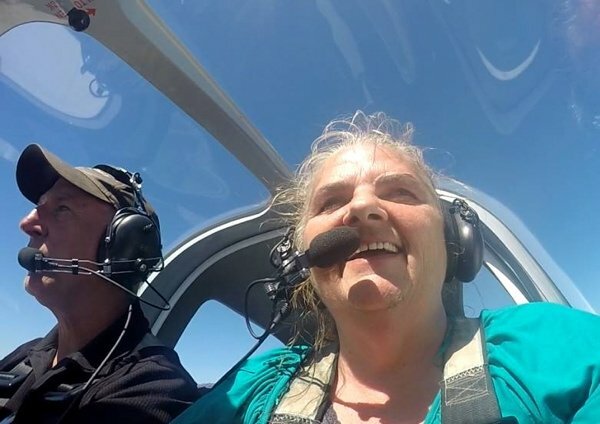 And, as a treat to herself, Lynny started taking flying lessons with a view to obtaining a private pilot’s license for microlight aircraft. It’s onwards and upwards from here! As of June 2019, Lynny has been medication-free for 5 years by using the products she produces for this website.